According to AllergyEscape.com, the most common foods that cause an allergic reaction are corn, yeast, milk, eggs, soy, wheat and sugar. These common food allergens trigger similar symptoms because they cause the same immune and chemical reaction in the body. A sugar allergy is difficult to diagnose because of its prevalence in most foods. If you suspect you have a sugar allergy, make an appointment with an allergist to determine the cause of the symptoms. Adverse symptoms after eating sugar may be related to sugar intolerance. A sugar allergy is a malfunction of the immune system. When sugar enters the body, the immune system identifies the proteins in the sugar as a harmful substance. It then produces IgE antibodies to fight off the sugar proteins, according to MedlinePlus.com. This process begins a chemical reaction that leads to common food allergy symptoms as the result of increased histamine levels in the body. Histamine causes inflammation in tissue where symptoms typically appear, such as the sinuses, stomach and lungs. A common symptom of a sugar allergy is nasal issues. The release of histamine causes the sinus cavity to become inflamed and swollen. The swelling of the sinuses causes excessive mucus to back up throughout the head, producing sinus headaches. Sinus headaches cause pain primarily behind the eyes, in the cheeks and the forehead. Other nasal issues include sneezing, congestion and a runny nose, according to MedlinePlus. As with any food allergy, gastrointestinal complications can cause abdominal pain, cramping, diarrhea, vomiting and nausea, according to AllergyEscape.com. 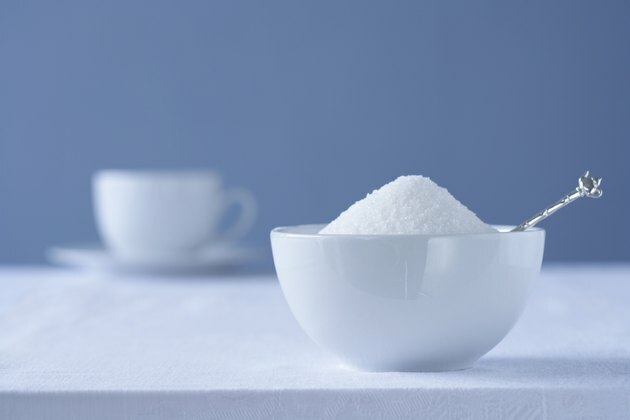 Once sugar is ingested, the only way to treat gastrointestinal issues is to wait for the body to expel the sugar. Common medications to treat bloating, gas and an upset stomach will not alleviate the digestive symptoms of a sugar allergy. Asthmatic symptoms are common with a sugar allergy. The airways become inflamed and swollen, reducing the individual's ability to breathe normally. This leads to shortness of breath, coughing and wheezing, according to MedlinePlus.com. Wheezing is a high-pitched sound in the throat from restricted air. If you experience asthma often, talk to your doctor about treatment options. The consumption of sugar by a patient with a sugar allergy can lead to anaphylaxis. Anaphylaxis is a severe allergic condition that could lead to death. MedlinePlus recommends asking the doctor if you should carry an epinephrine pen on your person in case of an emergency. What Makes Teeth Sensitive to Sugar?